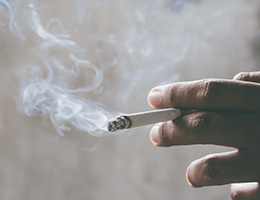 Feb. 12, 2019—Smoking raises the risk that African Americans will wind up with peripheral artery disease (PAD), a new study cautions. PAD develops when arteries become clogged with fatty deposits of plaque. It can lead to stroke, kidney failure, erectile dysfunction, pain when walking and even the loss of limbs. As many as 12 million people in the U.S. have it, especially those 50 and older. But it affects African Americans disproportionately. By some estimates, PAD is almost three times more common in African Americans than Caucasians. Smoking is a known risk factor for PAD. But until now, little was known about its impact on PAD in African Americans specifically. Researchers looked at the medical records of about 5,250 adults in the Jackson Heart Study. That's a large-scale investigation of cardiovascular disease in African Americans. Twice as likely to have beginning signs of PAD in their legs. Eight times as likely to have high calcium build-up in the aorta, the body's main artery. The study also revealed a strong tie between the risk of PAD and the number of cigarettes smoked. Those who smoked 20 or more cigarettes a day had much higher odds of PAD than those who didn't light up as much. Read the full study in the Journal of the American Heart Association. And Check out this infographic to learn more about smoking's toll on your body. This information is provided for educational purposes only. Individuals should always consult with their healthcare providers regarding medical care or treatment, as recommendations, services or resources are not a substitute for the advice or recommendation of an individual's physician or healthcare provider. Services or treatment options may not be covered under an individual's particular health plan. © Blue Cross Blue Shield of Arizona. An independent licensee of the Blue Cross and Blue Shield Association.